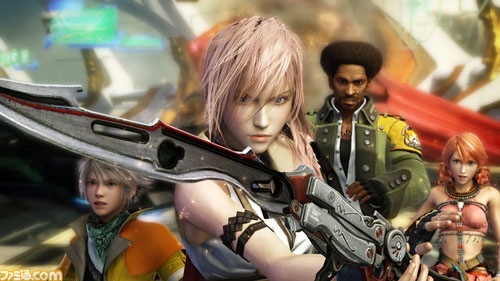 Final Fantasy XIII has been one of the most anticipated titles in recent years, having been announced at E3 2006, it has been a long wait but it’s almost at an end for most of us. Warning: This review contains some story info, not really spoilers but if you don’t want to know anything about the game, I suggest you don’t read it. A short summary of the story. The world you live on is known as Cocoon, it was created to keep humans safe from the dangers of the world below, Pulse. This world contains fal’Cie, beings that act as a source of energy for the world, people worship these fal’Cie as though they are gods. These beings are also feared for they turn people into l’Cie. A person turned into l’Cie must complete a focus, a mission given to them by the fal’Cie, should they fail to complete this, a terrible fate awaits them. The world also fears those who have been “touched” by Pulse and disposes of them by any means they can, either by exiling them to Pulse, or executing them. Our heroes for this game are turned into l’Cie, they must travel to not only complete their focus, but figure out what it is. 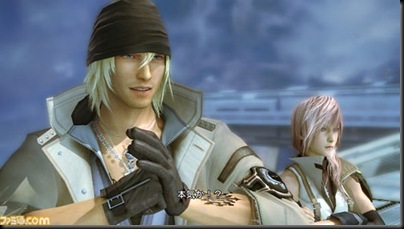 The crew consists of six seemingly normal people, Lightning, Sazh, Snow, Hope, Vanille and Fang. Each character has their own reason for fighting but all sharing the same focus. 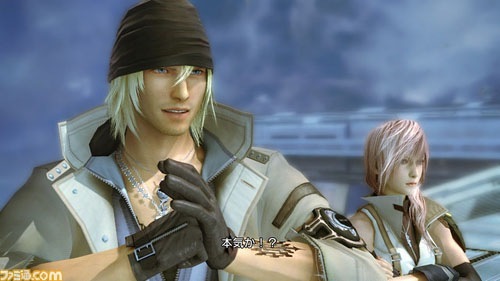 The battle system is a massive change in Final Fantasy XIII. The system is known as Command Synergy Battle, it draws a lot from the Active Time Battle. There’s quite a learning curve with this system, tutorials are given on a regular basis for the first few chapters to help ease the player into the use of this new system. The combat revolves a lot around the ATB bar, when the bar is filled, the attacks chosen are performed, even when not fully filled, the bars that are filled can be used at the cost of fewer attacks. Certain attacks take more spaces on the bar, basic attacks such as Fire and Cure will only take one space whereas more powerful magic can take up to three bars. Another thing important to battle is the Break bar, as you attack, the bar increases and as it does, so does the amount of damage you deal, once the bar reaches a certain point the enemy takes a lot more damage, indicated by the percentage underneath the bar, the best way to increase the bar is with combos. Remember though, the bar will go down when you’re not attacking so attacks must be kept consistent. During battle, you control only one character and change the roles of the other characters through the use of the Optima Change (Paradigm Shift in the west) which can be customized to allow the player to choose the role they want to play as well as making sure the other characters are playing the roles they are best in. There are six roles in the game, Attacker, Blaster, Defender, Enhancer, Jammer and Healer. These will be renamed for it’s western release to Commando, Ravager, Sentinel, Synergist, Saboteur and Medic. Attackers (Commandos) specialize in brute force, attacking the enemy for as much damage as possible. Blasters (Ravagers) string attacks together to create combos that increase the enemy’s Break bar. Defender’s (Sentinels) shield allies from attacks and provoke the enemy’s into attack them instead. Enhancers (Synergists) provide support for allies with a variety magic that improves everything from the damage dealt to the speed of the ATB bar. Jammers (Saboteurs) inflict status ailments on the enemy, slowing them, weakening them, anything that helps make them easier to defeat. Finally, the Healer (Medic) is fairly obvious, they heal the team and remove any status ailments that your allies may be suffering with. There is also Tactical Points or TP which is kind of like MP, there are a few special abilities that every character may use which include Summoning, Full Cure, Etc. Using these cost nothing to the ATB bar but does take points away from the bar which do not regenerate for a while. The whole thing feels overwhelming at first but players should soon ease into it after a few battles. The key parts of battle are slowly introduced over time, giving the player time to get acquainted with each aspect of battle individually. Summoning is also a very big part of the game. To gain summons, you must fight them under a time limit, these battles can be quite difficult but are very much worth it. Once you use a Summon, it will fight alongside you, the more attacks done increases the Drive Bar though you can activate it at any time, the drive bar is best used when full. During Driving mode or Gestalt mode as it will be known here, you use a variety of button combos to initiate attacks, each one costing a certain amount of points, the limit is 30 points. You can at any time in Driving mode activate an attack which will use all your remaining points but deal a lot of damage. Graphically, the game is impressive, maybe it’s because I’m fairly new to HD but I was amazed by some of the detail and scenery, especially during the parts at the beginning in Hanged Edge and during Chapter 5 in the Gapra Whitewoods. Levelling up in FFXIII takes the form of the Crystarium, as you fight, you gain crystal points as you would with experience points but unlike experience points, you use your crystal points when you want and you can customize your characters levelling. The system seems wholly similar to Final Fantasy X’s Sphere Grid, all characters only have 2 or 3 roles that they can play, once you reach a certain point in the game though, all roles are unlocked for everyone. As you improve your characters, more and more options are opened for them and you suddenly find that you need a lot more crystal points than you used to just to reach the next node. Equipment works very differently too, instead of just buying new weapons, you now find or purchase materials to level up weapons, each material gives a different amount of EXP and some even give bonuses that will boost the amount of EXP gained. The same can be done with accessories. There are still many weapons to find in the game, all of which can be upgraded but some can only be acquired through levelling up weapons until they reach a certain level at which point, you must use a special material to change them into a new weapon, these new weapons may not be as strong at first but once upgraded, they exceed the previous weapon’s stats massively. The soundtrack is quite simply amazing, it takes quite a new turn in the series but that’s to be expected as Nobuo Uematsu didn’t have any involvement at all in the music, making this the first major Final Fantasy game that doesn’t contain any work by Nobuo Uematsu. 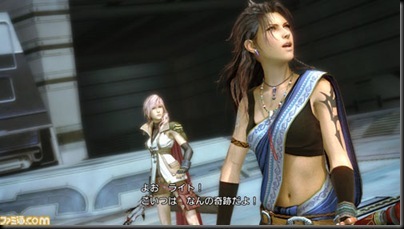 The soundtrack was instead handled by Masashi Hamauzu who previously worked on the music for Final Fantasy X and Dirge of Cerberus. 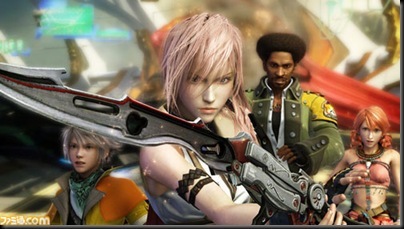 Masashi Hamauzu recently left Square Enix which is quite saddening as I think his work on Final Fantasy XIII is possibly his best. This game is radically different to any previous Final Fantasy but that doesn’t mean you shouldn’t give it a go. Some changes in XIII I liked, some I didn’t but I still think it’s a game that is worthy of anyone’s time. Length: I’m near the end at roughly 50 hours in. Flaws: Battles can sometimes feel drawn out and the screen can sometimes be cluttered during battle. Get it For: A great role-playing experience.